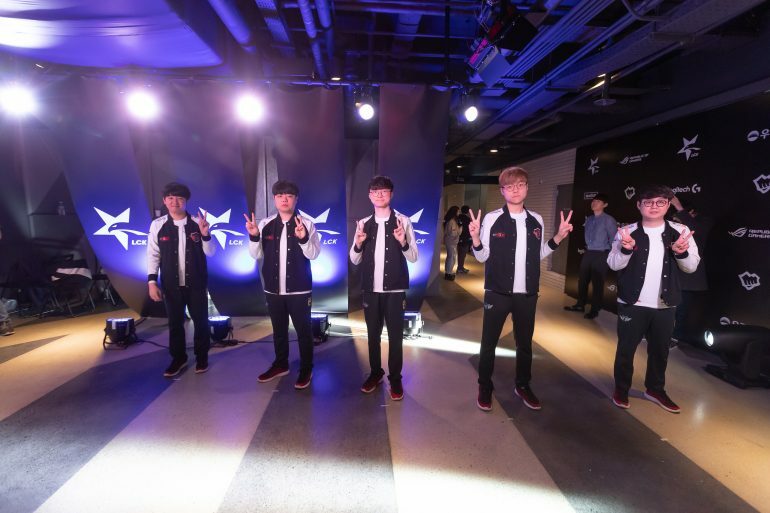 All year, two teams have vied for control of League of Legends Champions Korea. Upstarts like Sandbox and Damwon made things interesting for a bit, and a resurgent KINGZONE team are a solid third-place squad. But the two teams nearly universally ranked 1 and 1a in the region are Griffin and SKT. On Sunday morning, SKT made that hierarchy official by dispatching KINGZONE in a clean sweep to reach the LCK final where Griffin await. And while there were some loose moments in the games, SKT proved that they were the better team by taking down KINGZONE’s biggest strength. That strength was supposed to be the bot lane. KINGZONE’s veteran ADC Kim “Deft” Hyuk-kyu was totally robbed of the MVP for this split. He has carried this team further than most thought possible. But the first game started as a show of SKT’s bot lane might. ADC Park “Teddy” Jin-seong played in elo hell for years in the region, but this year, he’s finally on a good team and in the playoffs. He doesn’t have the experience that Deft does, but it didn’t matter as he shoved Deft out of lane and even got a two-vs-two kill. SKT simply warded bot side to ensure Teddy could do whatever he wanted with little jungle intervention. KINGZONE came back strong in the second game with winning lanes. At one point, they had SKT down to their last Nexus turret, and that turret had under 60 HP. But SKT’s late game again proved stronger because of Teddy and support Cho “Mata” Se-hyeong’s teamfighting and a clutch Baron from mid laner Lee “Faker” Sang-hyeok. Digging out of a 0-2 hole against this SKT squad isn’t an easy proposition, and it proved too much for KINGZONE. After making some crucial blunders in the first two games, Faker finally came through in the early game, getting an early assist for first blood and making sure KINGZONE couldn’t scale into the game. Faker’s been on Lissandra duty for weeks now but proved that his Akali is something to be feared. SKT’s victory in the series sets up the LCK final we’ve all wanted the whole time: A five-game showdown between SKT and Griffin. The last time these two teams met, SKT were incredibly close to stopping Griffin’s latest undefeated streak. It required a crazy backdoor from Griffin to come out on top. We can’t wait to see these two teams face off in the dream final. They play each other on April 13 at 3am CT to see who represents Korea at MSI.